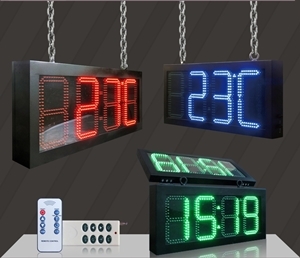 ANSO Superscreens indoor and outdoor time and temperature displays are a simple way for your business to attract consumers attention. Everyone needs to know the time and with this simple display consumers will find themselves looking at your business every time they pass. Is your business on a busy roadway? Then this low cost sign will ensure motorists look at your business as they drive to and from work. You will also become a talked about landmark. “Take the first street on the left after the Barry’s Bakery LED Clock”. Ideal for children’s play centres or Family Entertainment Venues where parents need to keep an eye on the time. Perfect for workshops, factories, retail stores, production lines, sporting clubs, pokies venues, play centres, family entertainment venues, shopping centres, sporting clubs or gyms. Daylight viewable and waterproof, for outdoor applications. Outdoor version has automatic dimming so its brightness is appropriate during day or night. Lightweight with mounting options so simple you could install it yourself. Contact ANSO Superscreens today for size and pricing information. Automatic night-time dimming with built in light sensor (optional).